The story of this Peach Cobbler Recipe and "Big Bob." Although fresh peaches are usually abundant during the summer and into the fall, sometimes people do not have easy access to them. This Peach Cobbler uses canned peaches and the recipe came to me from a fellow affectionately called "Big Bob." 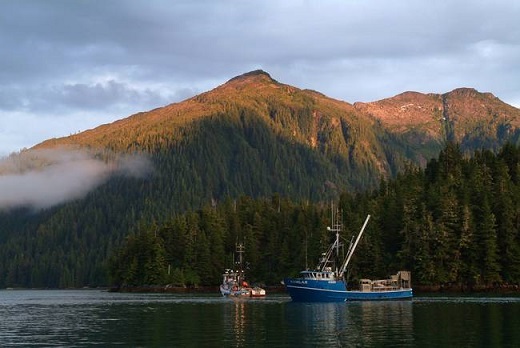 Big Bob was a cook on a fishing boat in the deep Alaskan waters. 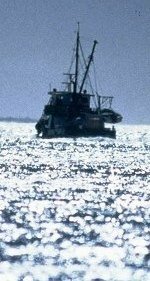 The boat would stay at sea for as long as it took to fill its hold with wild salmon. And space in the boat's kitchen was very limited. So canned peaches is what Big Bob used for his dessert recipe - a dessert that was greatly appreciated by the entire crew. Big Bob was indeed big ...a very large man. He was an even-tempered cook and was not offended by his nickname, but there was one thing that would get Big Bob's blood boiling. No one was permitted in his kitchen, his galley, - period. Bob's kitchen was off limits. Of course, if you've ever seen a galley on a smaller fishing boat you'll understand that no one could have entered the kitchen when Bob was in it. There was simply no room. But Bob meant no one could be in the kitchen anytime, whether he was there or not. He had a place for everything and he kept everything in its place. Despite limited product and a very small space in which to work, the entire crew loved Bob because he cooked great meals, had a great sense of humor and was a thoughtful, caring individual. Everyone who worked on the boat, remembers Bob for these attributes and, of course, his Peach Cobbler. Preparation time: 12 minutes. Serves 8. Do NOT serve right out of the oven. 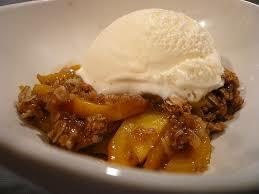 Allow the Peach Cobbler to cool a bit and then serve while still warm. And, oh, Bob liked to top the cobbler with vanilla ice cream if there was any in the freezer or at least whipped cream! Thanks for everything, Bob. Thanks for working at the restaurant and sharing recipes. 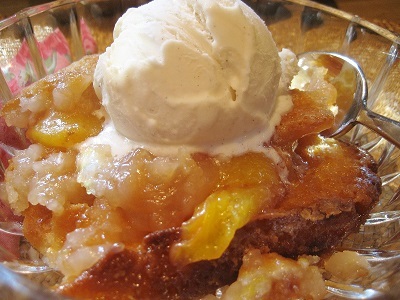 Enjoy your dessert - your Peach Cobbler Recipe from Big Bob and the company of those you share it with! The restaurant guests do! Did you know? Studies suggest peaches originated in China. Peaches were mentioned in Chinese writings as far back as the 10th century BC. The peach was brought to the Americas by Spanish explorers in the 16th century.